Special Order item: Delivery Time: 2-4 weeksA top-end high-visibility vest for sports and hunting purposes. 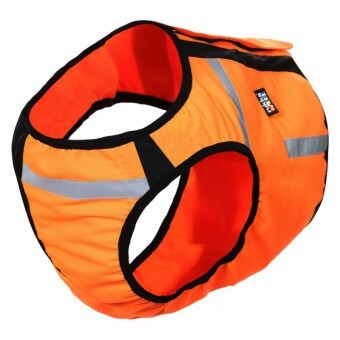 The front panel of the vest is made of very durable and noiseless material that protects the dog’s chest and belly from objects that might scratch. The elastic parts on the front make it comfortable for the dog to walk and run even in challenging conditions. The figure-flattering vest comes with a zip closure on the back. The zip closure is covered by a strong and wide fabric panel with a firm touch-fastener closure. The press-stud fastening on both ends of the panel ensure that the vest stays firmly closed also during high-intensity activities. The bright-coloured vest comes with several well-placed reflective bands as well as a place for the owner’s contact details.